These are apparently the first VR headsets to offer 360-degree sound field on the go. Huawei may have just announced the fancy P9 and P9 Plus smartphones in London last week, but it actually saved a little surprise for its Shanghai launch today. Well, we say "surprise" but it's also very much a "me too" thing at this point. Simply dubbed Huawei VR, this headset series will initially come in three flavors to let you slot in the company's most recent flagship devices: the two P9 phones and the larger Mate 8. Given their mere 1080p screen resolution, don't expect any crisp video quality through those goggles, but Huawei claims its VR solution is the first to offer 360-degree sound field on the go, as long as you have the right content loaded and your own headphones plugged in. The Huawei VR headsets work in a similar way as Samsung's counterparts: Just pop the front cover open, then secure the phone (with the VR app running, of course) using the clips inside, and then snap the cover back on. Likewise, they have a touch panel, a back button and volume keys on the right for interfacing with the app. You won't be able to wear your glasses underneath the goggles, but the adjustable lenses will accommodate myopia of down to -7.00. In terms of specs, you get the usual 20ms low latency and 95-degree field of view (it's 96 degrees on Samsung's Gear VR and 110 on the HTC Vive plus the Oculus Rift), with the added benefit of an anti-blue light filter to protect your eyes. The more exciting part here is obviously the content. 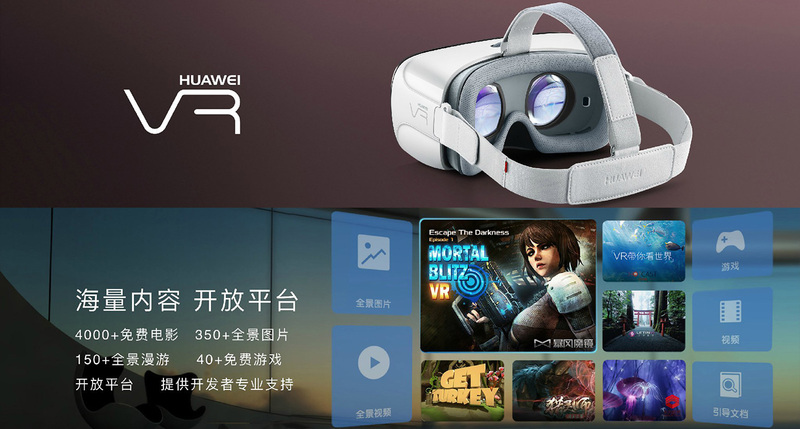 At launch, Huawei VR will offer over 4,000 free movies (presumably only a fraction of these are VR videos) and over 40 free games, along with over 350 panoramic images and over 150 panoramic tours. It's obviously still early days as Huawei skipped the price and date, so we'll just have to keep an eye out for a future announcement.